Socrates is frequently identified with the well-known question is ti esti? (What is it?). Most of his interlocutors are deceived by the extreme simplicity of this question and his detractors believe he does not know what an arête is. To this Socrates replies that he not only does not know what it is arête, but he has never met anyone who has done it. Using a term in ordinary speech does not insure that one has the kind of knowledge Socrates is seeking. The problem is not that arête is a technical or unfamiliar term but that as Socrates’ discussion with Meno soon reveals, it is a disputed one. In this paper I argue for the following conclusions. (1) Some passages in Plato – most notably one in Diotima’s speech in the Symposium – turn out, on close scrutiny, to put forward the view that ordinary sensible particulars are not, strictly speaking, identical through time, but rather consist of a succession of impermanent objects similar to each other. (2) This view is interestingly similar, at least in some respects, to modern and contemporary views held by such authors as Hume, Reid, and Chisholm. (3) This view was ascribed by Plato to several ancient sources. (4) Therefore Aristotle’s claim, in the Categories and elsewhere, that primary substances remain identical through time and change might be intended in opposition to Plato. Sokrates is about to be tried for impiety; the prophet Euthyphro plans to prosecute his own father for homicide. Sokrates asks Euthyphro, “what is piety?” The quality of their subsequent arguments is often judged inadequate. I argue that the main purpose of this dialogue is defending Sokrates against the legal and other charges brought against him. Scholars praise its portrait of Sokrates, which I argue is different from Plato’s other portraits on four points: an aristocrat, Sokrates shows class arrogance; his personality is unpleasant; he does not deny teaching; and he calls himself a sophos/sophist. Plato realized that these points, while historically accurate, were not the best defense of his teacher, so he cut short his inadequate dialogue and wrote the Apology, a far better defense and a literary masterpiece. The paper focus on a question that has two sides: one is the question, whether ancient philosophy still has some significance with respect to strictly philosophical contemporary problems. The other side concerns its capacity to give answers to our everyday life problems, by offering valid models of ethical behaviour and making a contribution to the human search for happiness. The control of propèteia, acquired through continuous exercises, is important to combat the imperative that still dominates the speed, becoming an ancient “therapy” for a contemporary “evil”. This paper aims to show the relevance of some of Herodotus’ ideas for two core issues of contemporary theory and practice of intercultural research, that is to say the researcher’s position and the search for an adequate approach to (cultural) diversity. Such issues are still usually addressed, if inadvertently, from within the exclusive framework of Western modern science, although they can be considered as recurring problems to which different and competing solutions can be given in any time and place. Herodotus’ Histories suggest a different solution, based on the method of autopsìa (“seeing for oneself”), so questioning the idea that only a particular understanding of “science” and the “scientific method” is the most correct one and therefore the only viable option to conceive of “research” in contemporary times. 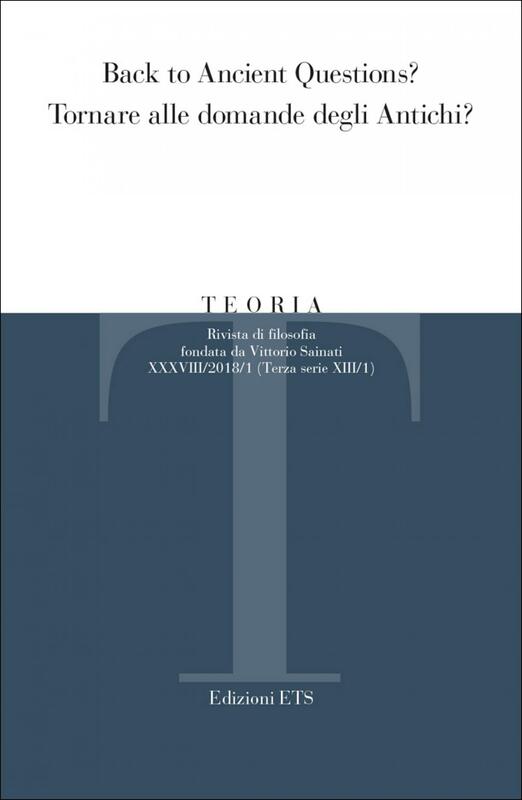 The essay analyzes aristotelian theory of fallacy and its influence on modern linguistic philosophy from Locke to Bentham to investigate the mechanisms of incorrect and misleading reasoning and explaining the strategies of deceptive manipulation still present in public communication. The paper aims to investigate Iris Murdoch’s Platonic mysticism, setting it in the context of the contemporary debate between perennialists and constructivists. Like many perennialists, Murdoch believed in the existence of an essential link between mysticism and morality: this clarifies why she was fascinated by Plato’s philosophy. She conceived of mysticism and morality as having the same essence, love intended as an eros purified from selfishness, and viewed mysticism as the perfection of moral life. Like constructivists, however, Murdoch rejected the idea that mystical experiences are essentially unitive: she used Plato’s imagery of the eternal forms to emphasize that complete unity with the mystical “You” can never be achieved, and that this impossibility assures the existence of a relationship. Mysticism is essentially this relationship, for Murdoch. Within our contemporary society of technological culture, the concept of banal evil has become “the culture of banal evil”, an evil that is not sought intentionally, but is occasionally provoked, freely or for futile reasons; the evil of action or inaction, of indifference, is characterised by one fixed feature: the absence of thought or judgement. The teachings of Socrates, then as now, provide an antidote to the process of banalisation evident in current society, a factor that erodes both capacity for reflexivity and the scope of relational proximity, resulting in a subtle dehumanisation of humanity and a reification of the persona. «If the prophets broke in through doors of night»: it is with this verse by the poet Nelly Sachs that I would like to introduce a philosophical reflection on prophetism that takes as its starting point certain leading figures of the Ecole Juive de Paris such as André Neher and Emmanuel Levinas. Biblical prophetism, on the one hand, revisited through a contemporary lens according to the perspective of Neher’s book Prophètes et prophéties. L’essence du prophétisme, will be reinterpreted in parallel and almost in chiasm with the perspective of an ethical prophetism, and even a prophetism “beyond ethics” as formulated by Levinas in the final parts of Otherwise than Being, or Beyond Essence.